Here's some background. This app was originally intended for developers who need to extract/copy apps from their Android device to other Android device or PC. On PC, you can simply drag and drop attachments to an email, but its not that simple on Android device. 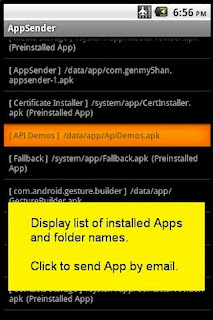 If you are an Android developer, you can extract/copy apps using Android SDK "adb pull" command along with the apps "install path" name. Since the install path information is not available from default Android GUI, AppSender can be used to help identify the install path name. 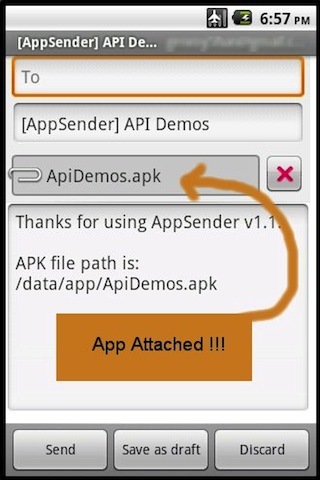 But to make things much easier, AppSender can automatically attach the selected app to an email on you Android device. Just pick an app from a list and AppSender will do the rest (send the app via email attachment). BTW, path name will also be included in the email body. Hope you enjoy this tool. If you find a bug or have feedback, please email me at moto.android.software@gmail.com. Copyright (c) Moto. All rights reserved. 「Awesome Inc.」テーマ. Powered by Blogger.